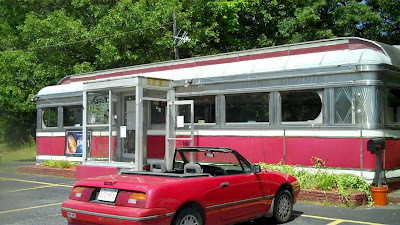 On July 22, the 22nd day of my quest to eat a hot dog a day in a different venue in honor of National Hot Dog Month, it was hot. 102 degrees to be exact! I wanted to find a place with Air Conditioning- no parking lots for me today. So I put the top UP on the convertible, cranked the AC full blast and motored out to Shrewsbury, Massachusetts to Mrs. Hotdogman's favorite joint: The Edge. It's like going back in time when you step through the doors. 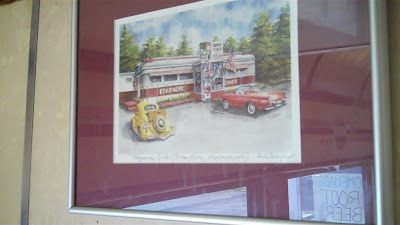 An artist's rendition of the "original" diner hangs on the wall in homage to the structure's iconic roots. 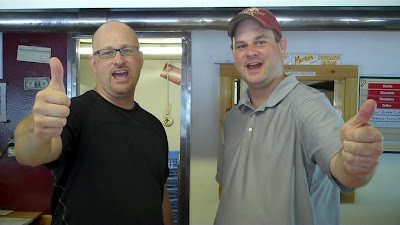 Co-owners and brothers Chris and Dave Krupstas bought the diner back in 2007. Originally called the Edgemere Diner, the place sat vacant for four or five years and fell into disrepair. 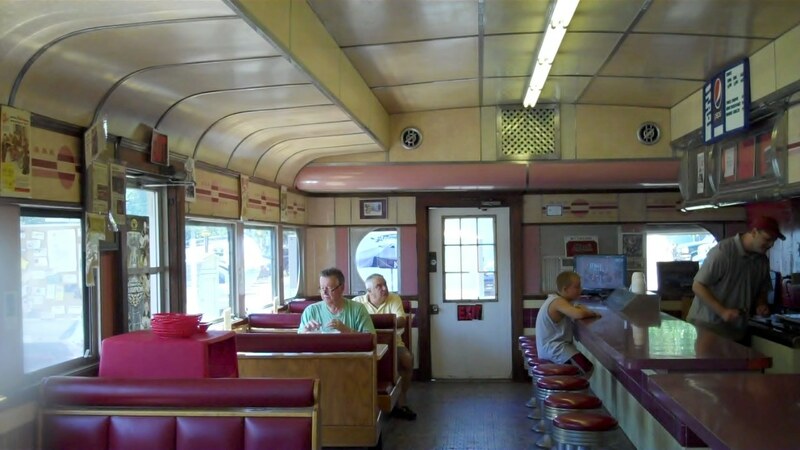 When the city decided to auction the structure off (the city owns the lot the diner sits on) the brothers put in a bid and bought the diner. They spent lots of time with their late father fixing the place up and bringing it back to its former glory. They even put a whole new roof on it. When they were done, they decided on opening a hot dog diner and shortened the name to The Edge. The Edge serves Kayem products: Old Tyme Franks and Fenway Franks. They serve full size dogs too, not the small ones. They also have awesome fresh hamburgers and fries. 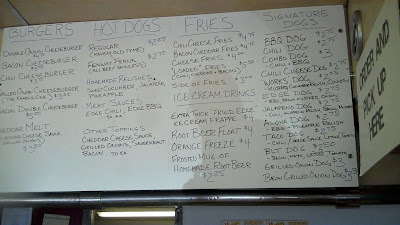 They are currently working on expanding the menu to include fresh fried clams (not frozen clam strips- FRESH CLAMS). 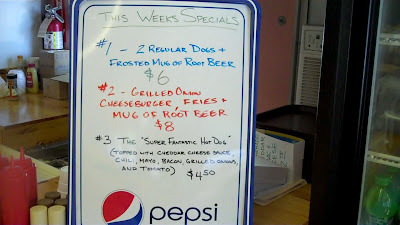 They run a weekly special too. 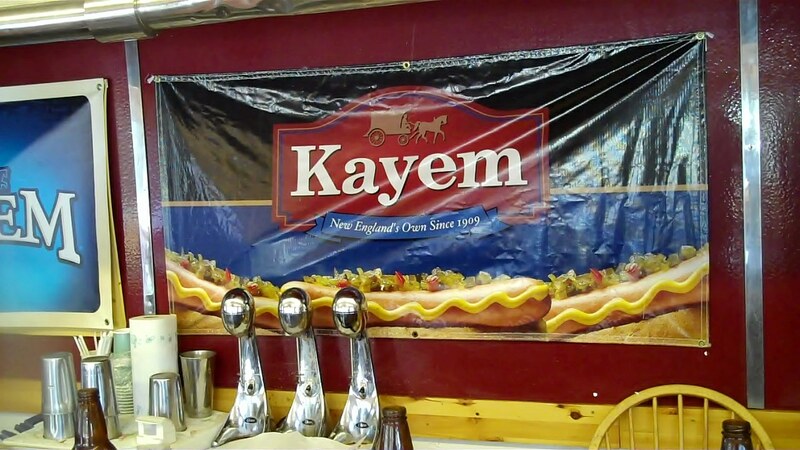 The brothers pride themselves on their fresh approach to hot dogs. 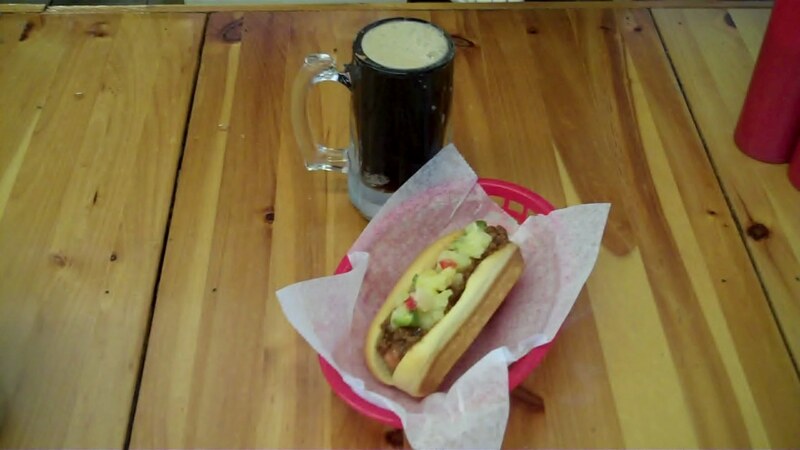 They make all their relishes and sauces fresh daily on the premises, they use only fresh baked Martin's potato rolls and everything is cooked to order. You can even get relishes to take home- they were almost sold out today. They take their freshness approach seriously. 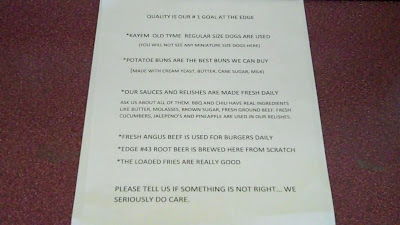 As the sign says: "Quality is our # 1 goal at The Edge." 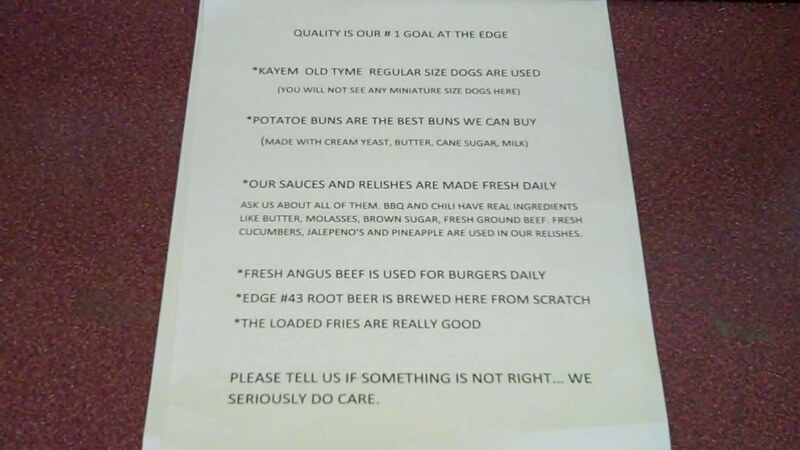 They also adjust their menu according to their customer's suggestions. Customer feedback is appreciated and acted upon by Dave and Chris. 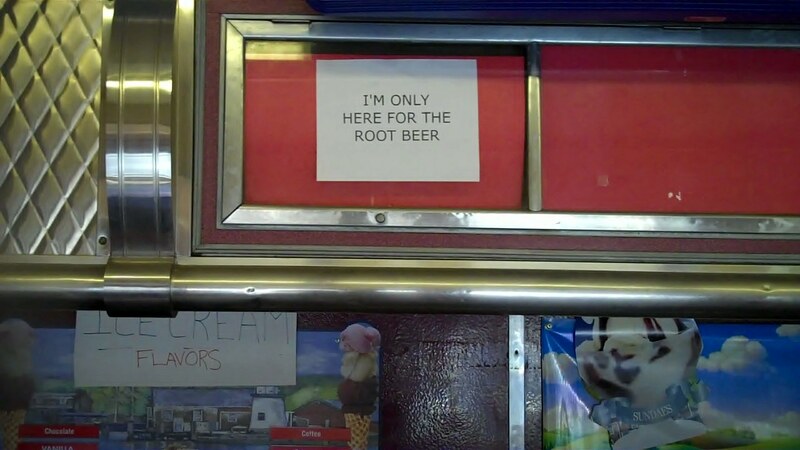 The sign says "I'm only here for the root beer." Guess what else they brew fresh at The Edge? Yep, real old fashioned root beer like grandma used to make. 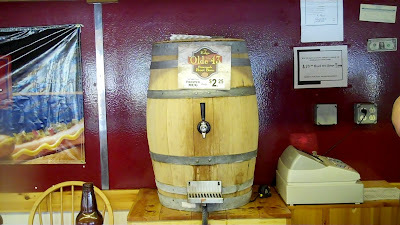 They brew it up on site in these barrels and serve it up in frosted mugs. 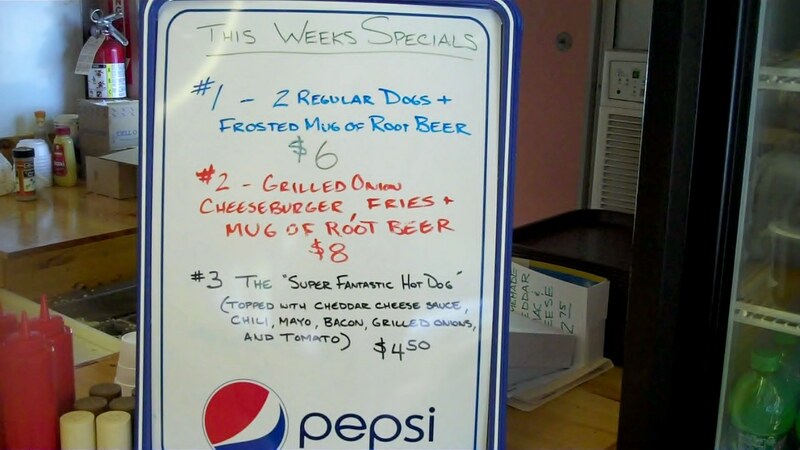 I here they serve a mean root beer float too, but my diet wouldn't allow it! 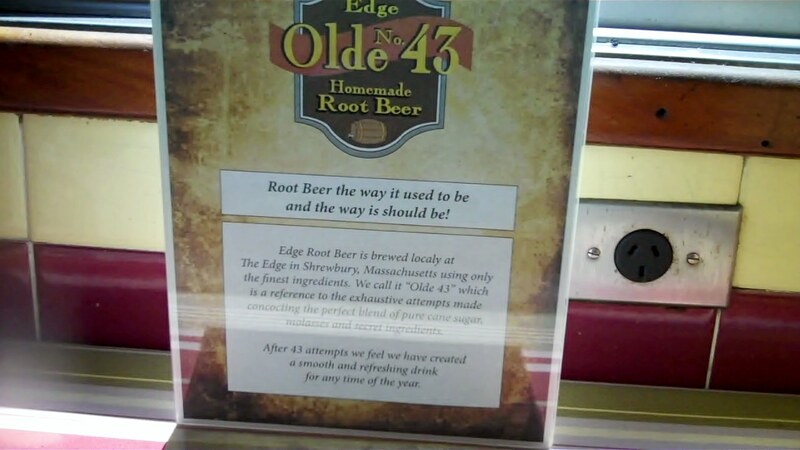 They call the root beer "Olde Number 43" since it took them 43 times to perfect the recipe. Lots of customer feedback was solicited for this project too. You can buy the root beer by the four pack or by the case too. 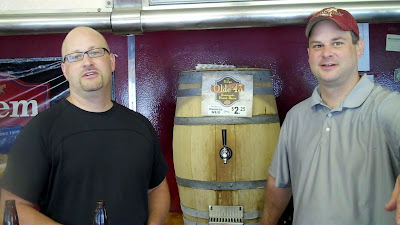 The boys are working hard at getting their product out beyond the confines of the diner. 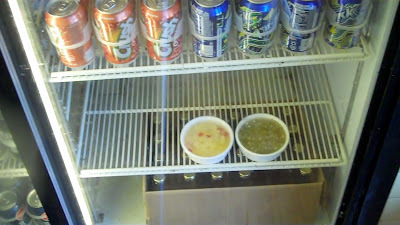 The Brockton Rox are selling it at their stadium and the boys have a few area convenience stores stocking the product. 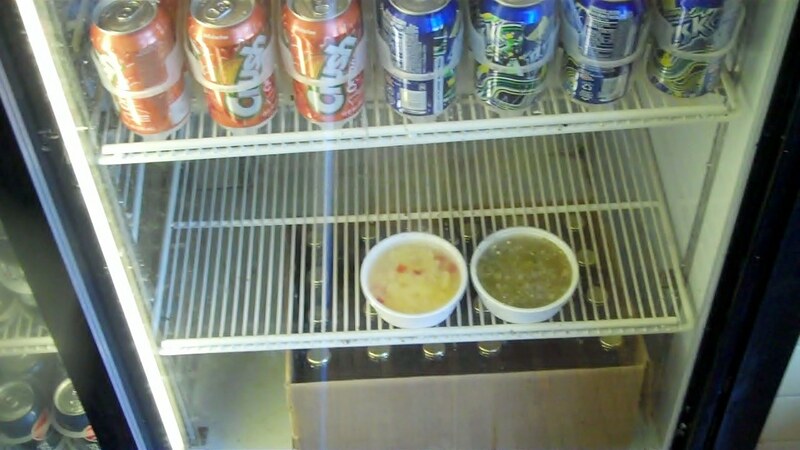 They'd like to get it on more store shelves and in other area restaurants as well. 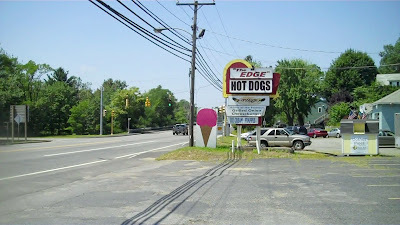 Stop by The Edge when you're in the area and tell the boys "the Hotdogman sent me!" HAPPY NATIONAL HOT DOG MONTH!!! See the video of my visit to The Edge on Hot Dog Stories.